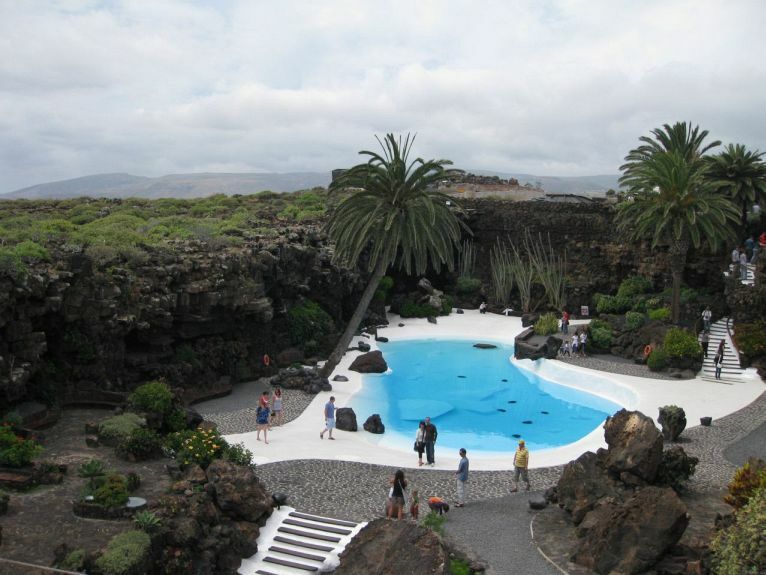 Our visit to Lanzarote was very nice. 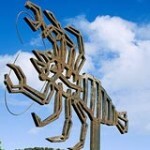 We saw a lot of different sites, some of which were very interesting to see. 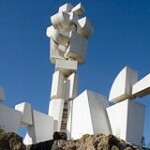 Today we went and visit the touristic attractions of the island. It was possible to buy a combined ticket for 30 euros. 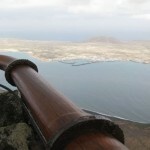 With this ticket we could visit 6 different sites in Lanzarote. Make sure you’ve got the money cash, because a lot of sites don’t accept cards. 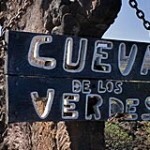 Our first visit was to a big cave, the ‘Cueva de los Verdes’. It was a very big cave, but nothing more. Not really worth the visit. 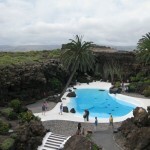 After the cave we went to the ‘Jameos del Agua’ and this was a much more worthwhile visit. A Jameo is a lava tube that broke down, and that supports a lot of plant life. This specific Jameo had a little pond in the center which is the only place in the world where a little white, blind lobster is living. The surprising thing was that there did not seem to be very much protection for this little lobster. If I had wanted to I could easily have picked one up. 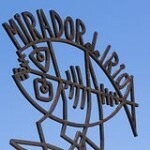 Afterwards we drove on to the Mirador del Rio. 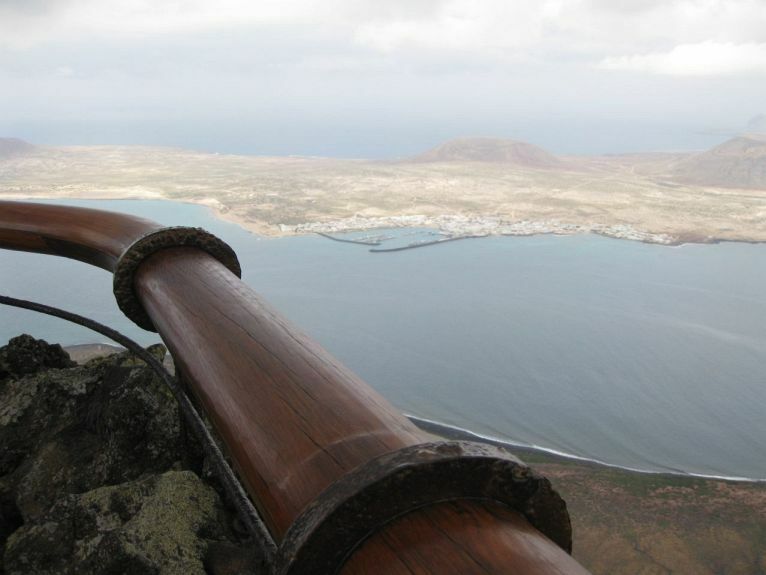 A nice viewpoint on the top of a big hill where you can nicely see the nearby island ‘La Graciosa’. There is also a bar. The view is worthwhile, but selling a ticket to enter a bar was a bit to much. They clearly suffer from over commercialization in Lanzarote which you clearly notice in some of the tourist attractions. 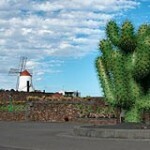 After our visit to the bar on the hill we want and visit a cactus garden. It was a pretty big garden with quite a lot of cacti. 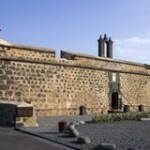 The last thing we visited today were the volcano grounds called Timafaya. This was a very nice visit. It included a bus tour through a landscape that looked like it was copied from some science fiction movie. 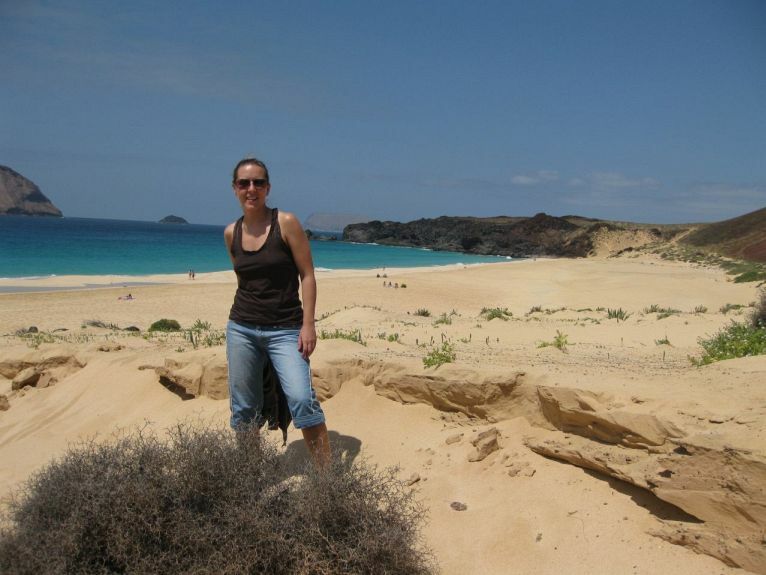 Today we enjoyed a nice boat trip to the small nearby island La Graciosa. 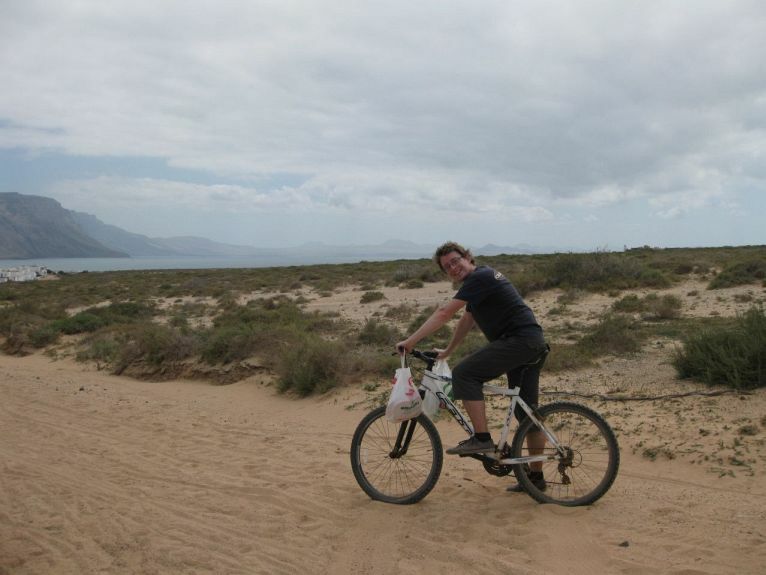 Here we rented some bikes and visited a few of the islands beaches. We had a very nice day. 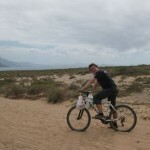 When we came back to the harbor and returned the rented bikes we needed to wait a while for the boat to arrive. We noticed two bars. One full and one empty. Because I did not want to wait we sat at a table in the empty bar. We ordered some Spanish hot snacks and we found out why the bar was empty to begin with. Uneatable! At night we visited the MIAC. A little castle with an art exhibit. It was a very small art exhibit because there were just three little rooms. Afterwards the exit took us to a bar with a nice view. Our last day on the island. Today we drove to the south. 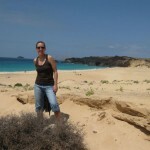 First we visited playa Blanca and afterwards we went to the playas de Papagaja. 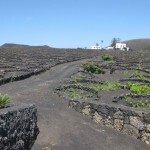 After the beaches we passed the wine areas. It was an impressive view to see that each grape had it’s own little circular space. The visit was very nice. 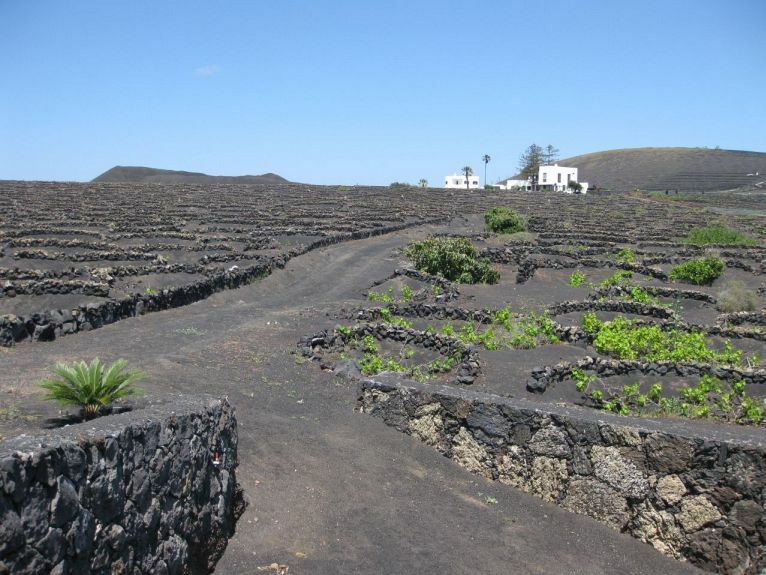 There are a lot of areas that look surreal because of the volcanic rock everywhere. The little homes on the island are almost all a nice crisp white with green window frames. I did get the nasty feeling that at times a lot of effort was being made to separate the tourist from his money. When we’re back I’ll post some images and a little report about our visit. Although April fools is for some strange reason celebrated on the 28th of December I did notice some April fools influences from the rest of the world. 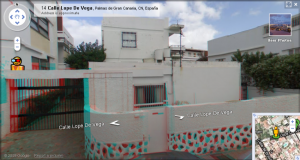 By coincidence I was browsing google maps when I noticed that the entire city of Las Palmas was displayed in 3D. The only ‘but’ I could think of was that clearly you needed the typical blue and red glasses to see the effect. Still, I was surprised and it was nice to see.